Anyone hoping to become fluent in Korean can learn the language by taking a plane ride to Korea and learning through immersion, but that isn’t a reality for most of us. Thankfully, there are other immersion solutions that allow anyone to learn Korean from the comfort of their own homes. This solution is more affordable than any plane ticket to Korea and can be used conveniently anywhere you have a smartphone or mobile device. 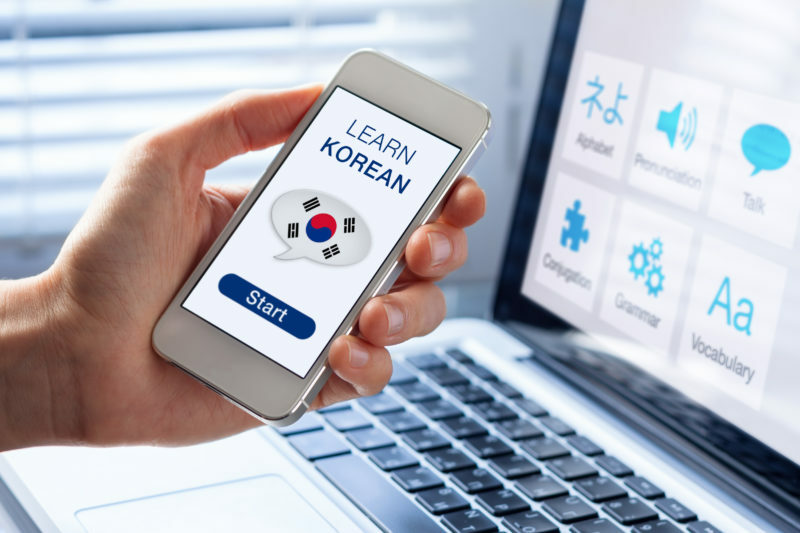 By using language immersion software, you’ll be able to use the best way to learn Korean software to learn this language. This type of immersion software offers users several different resources to gain an interactive learning experience. Whether you start as a beginner or you’re almost fluent in Korean, you’ll find that this kind of software helps to drastically improve your Korean speaking abilities. Looking for the best way to learn Korean software? If you haven’t found success in the traditional methods of language learning, it’s likely that you need a better solution that is designed to cater to your needs. Language immersion software for Korean is essentially a language learning school that you can use wherever, whenever, and however you want. This interactive experience features audio, textual, and visual resources that help you have a thoroughly immersive experience. These programs keep each lesson dynamic and refreshing, which is a welcome change from the stale pace of a traditional classroom experience. Many of these programs even come with their own special online database so users can have access to bonus material. Other add-ons include online forums that allow users to communicate with other learners, as well as native speakers. Immersion software shares many similarities with other online courses, but these software programs are often more involved and typically offer a wider variety of resources. These immersive programs are designed to surround users with the Korean language as much as possible, which works well for highly motivated students. There’s a reason why flashcards are such a timeless method for studying. Using flashcards will help to keep your memory fresh as you flash through various vocabulary words. This traditional language learning tool will allow you to quickly refresh your memory in an efficient way. As you get used to the immersive software, be sure to use the flashcards alongside the software. Keeping a large stack of all your new vocab words with you as you use the software will give you ample opportunity to learn as much as possible during your study sessions. While you may grow used to the convenience of immersive software when learning Korean, it’s still helpful to include writing things down as part of your studying. With a language learning notebook, you’ll be able to write down any important notes, as well as any phrases you may read or hear that you want to remember later on. Though you can go over any lesson on the software whenever you want, it is still a good idea to keep a journal handy. That way, you can have access to your notes in case you are away from the immersion software or if your mobile devices happen to be out of battery. The immersion software has various lessons, like any real language learning curriculum would. Create an agenda for what you would like to learn and try to stick to the schedule. With no teacher around to supervise your progress, you’ll have to be on top of your own schedule. If you find that you have a friend that wants to learn Korean with you, try to keep each other accountable throughout your studies. By having a partner to do the lessons with, you’ll both be more encouraged to keep up with the program. Though there is a wide variety of information with the immersion software, it is still important to use non-digital methods for learning like textbooks and exams. Supplement your coursework by reading relevant chapters from your textbooks. Additionally, create self-made exams or search for exams online that allow you to review your material. Seeing what you get right and what you get wrong will help you to know where you need to make improvements in your process. A major part of what makes immersion so effective in learning Korean is the fact that you’re completely surrounded by the language. In addition to practicing on the software, and studying with flashcards and textbooks, it’s important to speak Korean with other people. Talk to other learners and native Korean speakers to allow yourself the opportunity to speak the language on a regular basis. If you can get to the point where you only speak Korean throughout the day, you’ll find that your language learning improves greatly. If you can’t do this, try to commit to speaking Korean at least for an hour or so each day. There’s a reason the Rosetta Stone is one of the most popular software programs for language learning. This immersion software has an extensive amount of material and very efficient teaching methods. With this curriculum, you can improve your writing, reading, speaking, and hearing skills through games, lessons, pronunciation practice, and exams. With the mobile app, you can take the Rosetta Stone wherever you go. The Rosetta Stone can be downloaded to your computer or can be used in CD format for $199 or for $249 for a year-long online subscription. The Rocket Languages program is a great immersion program for beginners. Even users with zero knowledge of Korean can use Rocket Languages and learn to speak Korean on a conversational level. This software is an excellent resource for picking up essential Korean basics, which is incredibly important for anyone hoping to speak with native Korean speakers. Available for $299.95 for the CD pack and online access or $149.95 for unlimited use, Rocket Languages is one of the more inexpensive options for immersive language programs. There are many more programs available for immersive language learning. As you continue your journey to learn Korean, be sure to keep this guide and these tips in mind.